The authorities apparently cannot understand why the trees here are so leafy and so rich in shade. The Horticulture Authority tried to rid the city of all its shady trees and replace them with date palms. Lahoris watched quietly. In the end, it fell to the palms themselves to protest the initiative. The palms planted along the Circular Road, it has been reported, are wilting and dying. Actually the genius who thought of depriving the city of its own trees and adorning it with desert trees should also have imported a little desert. Trees, after all, grow from soil and are best nurtured in the climates associated with their native lands. In the lands and climates where it grows naturally, a date palm is lovely. If Lahore’s innovative gardeners are so keen on it they might as well arrange for the right soil. Once the thick shady trees in the city have all been uprooted the place will automatically turn into a veritable desert. But that may take a while. The authorities apparently cannot understand why the trees here are so leafy and so rich in shade. The straightforward thing to do of course is to cut whatever trees are left standing, but there are still people who object to that. It is to avoid such noises that they have to propose plans that give the impression that the city is just getting new kinds of trees. 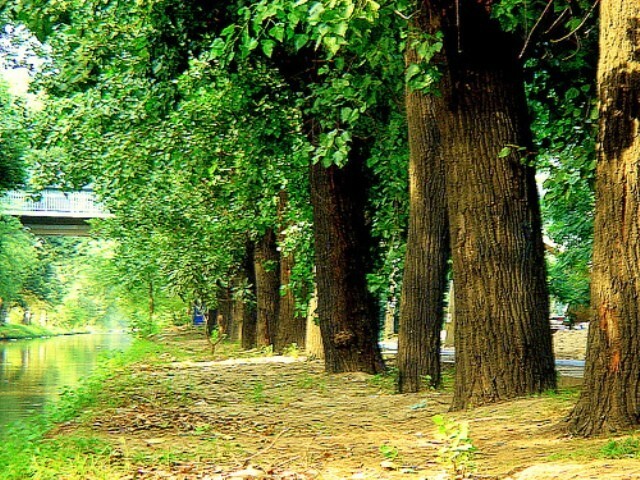 One remembers a senior city official who visited Japan some decades ago and on his return thought of uprooting the tall thick trees at Gol Bagh in whose shade Lahoris used to relax in the summer and replace them with some experimental Japanese shrubs. Lahoris, of course, reacted strongly with some activists even taking out a rally and the plan was somehow abandoned. But activities hostile to the trees continue on one pretext or the other. I am reminded here of an Urdu verse arguing for enterprise and optimism, that promises the traveller thousands of shady trees on the way. The reference is so clearly to lands like our own where summers linger long and the sun is totally unsparing. Nowadays of course we have railways and aeroplanes but rural folk still rely on camels and bullock carts. Some brave folk even walk. The shade of a tree along their path lets them pause and cool down a bit before resuming their journey. It is only in extreme weather like ours that one may fully appreciate what blessing tree shade is. In fact, where there is abundant tree cover, the summer does not get so hot. Cutting trees causes the climate of a region to change. The environmentalists therefore consider the trees important. But such arguments are lost on our city officials. If they cannot find another excuse to uproot trees they justify it by citing a need for widening the roads. The bureaucratic mindset apart, there are business interests to reckon with. Some of the development planning inevitably stems from commercial interests. There needs to be awareness among citizens therefore of the problems such plans cause. Not long ago there was a plan in India to cut a large number of trees – the logging industry have there interests to watch. The citizens responded with a tree-hugging movement. The tree-huggers vowed to protect the trees or die trying. That was how they saved their trees. One does hear once in a while that some group in Lahore is taking up the cause. Citizens however are not quite aware of what the trees mean for the city. No such movement therefore is as effective as it needs to be.